For more than three-quarters of a century, our Super Extra Large Virginia Peanuts have set the standard for excellence. Selected from the top two percent of the peanut crop, the peanuts are cooked to perfection then lightly salted. One taste and you'll agree our reputation for quality is well deserved. Packed in a 36 oz. vacuum-sealed tin designed to reflect our heritage and to stay crunchy longer. Received American Heart Association's® Heart-Check mark. This Company never disappoints. Every time I order from them, the quality is always the same. The delivery time is excellent and the value is unsurpassed. I will always use this company until the day I die. These are the best peanuts that I have ever eaten. Orders come promptly and nuts are the best! I don't know if it is the flavor or because they are so fresh but these are the best peanuts ever. I just can't go back to any of my other brands. Having grown up visiting the Virginia Diner regularly, t's always great to bring back wonderful memories with a first class product. Excellent as always! They are big, crunchy, and delicious. The Peanuts are the best and the service was out standing. I'm a lifelong Virginian who has been eating peanuts since he was a toddler. I even had an uncle who grew them. I've lost track of the number of years I've been ordering peanuts from Virginia Diner, but they remain the best peanuts on the market. My wife and I can't get enough of them. Love your gourmet peanuts! Such crunchiness!! Your peanuts are my husband's favorites. I have been ordering your peanuts for 20 years! When there is a sale I stock up. Best peanuts I have ever eaten. They are great for gifts as well. I would order more products in you occasionally offered "free shipping". Hubby has been eating the usual grocery store available peanuts for years but when he tasted these, my childhood favorites, he was blown away! Can I say "I told you so!"? The peanuts are huge! Crispy and fresh. Perfect amount of saltiness. Absolutely delicious. I will order again. Nothing on the west coast compares to these peanuts. We have been ordering Virginia Diner salted peanuts for years and always try to have a large can in the house. They have a superb crunch! I received Virginia Diner peanuts 5 years ago as a gift and loved them so much I have continued to buy them for myself and others. These Virginia Diner salted peanuts, large and blistered, are a wonderful, unique gift from our state to folks far away, like Alaska. They are well-known and always appreciated and enjoyed! These are the best peanuts I have ever eaten. I cannot go back to grocery store bought peanuts again. Always a great service. Arrived on time and no damage. We give Virginia peanuts as gifts from back home. Virginia Diner peanuts are the best!!!! Arrived on time in good condition. I ordered later than I meant to and did not think I would relieve my prefer before Christmas. I did receive it in plenty of te to wrap and distribute for Christmas!! The nuts are GREAT as usual. Our Friends love to see that square wrapped box!!!! THANK YOU!! You won't be able to go back to grocery store peanuts! We love Virginia diner products. They are a little pricey but well worth it for the quality. Don't take my word for it try it once for yourself and you will be hooked ! I received a tin of nuts as a gift. I can live off of nuts, and these would be a staple. Virginia Diner, you have a customer for life, i like to gift your products as well as keeping a few cans for myself. I've been eating VA diner peanuts for 25 years. They are without a doubt, the best you can buy. I've tried others and they don't compare. The website is also easy to navigate. Love this company and it's product. I order both the salted and unsalted for our office. Everyone loves the peanut flavor and the CRUNCHINESS! Also, the shipping is really fast, and everything is meticulously packed! Excellent peanuts but you do pay the price for that. Virginia Diner has the best peanut and other nut products on the market. 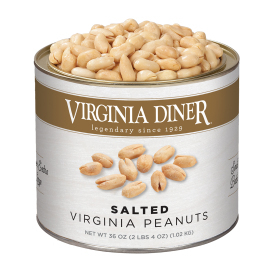 Your large can salted Virginia Diner Peanuts are WONDERFUL! After receiving these peanuts as a Christmas gift one year, I have not been able to eat any other brand of peanuts. These are so good. I'm spoiled now. Excellent, as always. Best peanuts! Great quality as usual. Love to receive discount opportunities since I have been buying from you for a number of ears. There isn't enough words to say how fantastic the Virginia Diner peanuts are. We will be ordering often. I was very pleased with the service I received from the operator who took my call to the receiving of my order. Been ordering from you for years now. Have actually visited your restaurant for breakfast. Really enjoy your peanuts! My wife and I love the Salted Peanuts. They don't last long once the can is opened!! I've been buying your peanuts by the case for years now. It is nearly impossible to eat other peanuts. A friend of mine lived in Virginia and brought a can to us one day and we were sold. Living in Massachusetts it's very comforting to know how easy it is to get the World's best peanuts from Virginia Diner with just a few clicks on my smart phone. Thank y'all! Our out of state guests LOVE these peanuts! We often sent a lg can as a holiday gift, thank you gift or for a special occasion. It's a lovely way to highlight VA! Bought this for a gift. Always a hit! Consistently the best ever...customer for 20+ years. Amazing peanuts. Delicious. So worth it. I have been ordering Virginia Diner peanuts for over 30 years. They are by far the best tasting and quality peanuts you can buy anywhere. I have also bought other nuts, peanut butter, double dipped chocolate peanuts, trail mix, raw unshelled peanuts,cashews, peanut brittle, etc. All of it is high quality and delicious and a good price. I won't buy any other brand. Peanuts were outstanding in size (large and whole) and taste. Enjoyed them very much. one of my favorite discoveries of the past year! When we were in business ,we would buy from you on a regular basis. Our employees looked forward to coming into the off ice for a handful of delicious Virginia Diner peanuts! You haven't changed and boy are they good! We love these 'Virginia's peanuts. We keep a supply in our house at all times. We sent peanuts to our family members who we planned to visit in FL. Unfortunately, we didn't make it but the delicious peanuts did. Our family loved the peanuts during their hurricane party. I use your salted peanuts to make peanut brittle at Christmas time. I just leave out the salt in the recipe. Your peanuts are always top quality; much better than I can buy anywhere else! These are hands down the best peanuts on the market. They make a truly wonderful gift! Must have at all times! VA Diner peanuts are nothing short of a requirement to have in my house at all times. These are absolutely wonderful and remind me of the days past when we'd get raw peanuts, boil them for a few minutes to loosen the skin, dry them off and then fry to a golden tan. Beyond goodness if you like peanuts as much as I do. There is nothing better than VA peanuts except VA diner peanuts. Your mail order could not have been easier and the delivery was very fast even using the economy mail service. Always great, delivered quick, and a real treat for those of us in the North! You are always efficient and this order was no exception. Excellent service! We received a can of these nuts as a gift and they were the best we've ever tasted. I decided to order some to give as Christmas gifts and the package arrived quickly and well-packed. Virginia Diner Peanuts are simply the BEST. No other peanut compares! These are the very best! Give them as presents every year - they love them! Thanks Virginia Diner! Your products are uniformly the best around! Best peanuts I ever ate. Everyone that has tasted them loves them. Every Christmas for the last few years we have received from friends a gift of an assortment of Virginia Peanuts from the Virginia Diner. We are particularly fond of the Salted Peanut. They are delicious and when we ran out of the gifted package we decided to order some on our own. So, we got two 36oz cans to hold us for a while. They are my go to snack! Excellent flavor and the right amount of salt. Not too much. I feel sorry for those who've never had Virginia peanuts because they're missing out on one of the joys of life. If you are a peanut connoisseur, look no further. I love the crisp, lightly salted peanuts much better than any I've had. These are the best peanuts on the market. Don't hesitate to INDULGE!!! Have been ordering for years...always great! Stopped and had breakfast on the way to the Outer Banks...nice to visit the actual place. I used to order the salted roasted peanuts for years, but with several moves since leaving Indiana, I stopped ordering them until recently. I found myself in Eau Claire, WI and somehow craved good peanuts. I remembered Virginia Diner and ordered one can. They were as good as I remembered. I ordered another big can, but also tried a can of Butter Roasted Peanuts. They did not disappoint. I think I'm hooked again, and I hope these come in bigger cans. Once you've had VA Diner peanuts, you can't go back! I always buy as a treat for Christmas, but have had to buy a few times since per family request. My husband asked me to order again before we run out! These are the best peanuts in the world! I have not received my order yet, but I am looking forward to it!! Owner Response: Thank you for your review. Unfortunately, CA is a good distance from VA for Ground and Economy shipping, taking the long road! Be sure to reorder before you hit the bottom of the can! =) Or, set up a bi-monthly or monthly shipment with us. We are glad to assist you with this! Perfect in every way! Thank you. Great products, I got the order in two days. Wow! We have and are enjoying the peanuts we have purchased recently, as well as the ones we purchased around the holidays. Thank you for you assistance when we have questions. The people in customer service are experts when ordering. Don't change a thing. We'll definitely be placing an order in the coming months! Easily the best peanuts on the planet. Great product - the best ever peanuts! Excellent product. Excellent customer service. Perfect combination! Thank you so much! Great products, I have been buying for years! Best peanuts I've ever eaten. Fast service. We love Virginia peanuts and only buy from Virginia Diner. I have given Virginia Diner peanuts as Christmas gifts to everyone! The peanuts are lightly salted and not oily. The small packet are perfect to give everyone a bag in the office. This current order we are donating to a silent auction in a Taste of Virginia basket. Highly recommended! Everything I've tried has been great! Roasted, Old Bay spiced, chocolate covered, you name it. Keep up the good work! 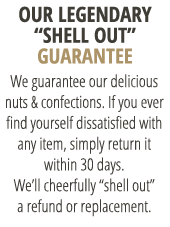 I order different varieties of nuts from VD and enjoy everything I get. The Old Bay always bring me a little slice of home! The review title says it all. Prompt accurate service. My dad used to bring us back peanuts and a peanut pie while on one of his trips and they were always great. Reminds me of those days! It is a family tradition to order Virginia Diner Peanuts for the holidays. They never disappoint! My sister introduced me to Virginia Diner peanuts & now that's all I buy. Fresh & crunchy. Love them. The shipping is fast. Highly recommend! Giftees are nuts about these! I sent several varieties of nuts as Christmas gifts and everyone loves them. Thanks, VA Diner. Virginia Diner products are the best! We have never tasted a better peanut. One of my cans had no lid on it. I had to open it with a can opener which proved to be difficult and then I had to transfer the peanuts to zip lock baggies. Owner Response: This traditional commemorative tin comes with a plug metal lid (gold end of the can) that is pried open with a butter knife, spoon, key, coin--whichever is handy. It keeps the peanuts a bit fresher as it is a tighter fitting lid than the plastic over cap found on the other cans. Put your peanuts in the freezer to keep them fresh longer. They do not freeze (little water content), and only need a couple of minutes to reach room temp when you are hungry. We eat them straight out of the freezer. There are ALWAYS peanuts on hand! I have been buying peanuts from VADINNER for several years and the quality is not as good as I remember. Every container is different. Some are very crisp as they used to be and others are still good but not as crisp and crunchy which is why I buy from here. They are the best peanuts, love them. The best, crunchiest, lightly salted peanuts to be found! Customer service is very friendly. They were not stale this time. Last batch was stale and rubbery. We ordered two large cans of gourmet peanuts. They are excellent. Will order again, sooner rather than later. Can always count on Va. Dinner having the best peanuts Ever! THE PEANUTS ARE ALWAYS FRESH AND THEY ARE DELIVERED FAST. EXCELLENT TASTE. The peanuts are VERY GOOD! If I ever get that way, will be sure to stop by! We gave some to our Dad for Christmas and he can't get enough, I've ordered 3 more times in 3 months. Your peanuts are so good! I sent your products as a gift, and received rave reviews! VA Diner, Your nuts are the best I've ever had!!! I get mad when people offer me planters nuts-no compare!!!! Best peanuts in the world!!! I love your peanuts but the price point with shipping is too high. I can go to the big box stores and get peanuts that are good (not quite as good as yours) for 1/3 the cost. I go through about 40 oz. every two weeks. I will only buy your for special occasion. It's been a couple of years since we ordered Virginia peanuts. We have just fallen into the bad habit of grabbing whatever jar of peanuts is on Walmart's shelf. But then one of our sons sent us a VA Diner gift packet and "Wow!" VA peanuts are SO much better than anything you can get locally. Won't make that mistake again! VA Diner - you're our peanut supplier from now on! We just can't seem to stop eating these peanuts. We especially like to order the large can. The very best peanuts you will ever eat. They are almost additive they are so good. I have tried several different kinds of their nuts and they are all terrific. Ordering is easy and shipping is quick. If you try some you'll be hooked! best peanuts I have ever eaten. friend gave us a can and I ordered 2 more.